I’d thought that Agent Doorn would have a false address for her house. 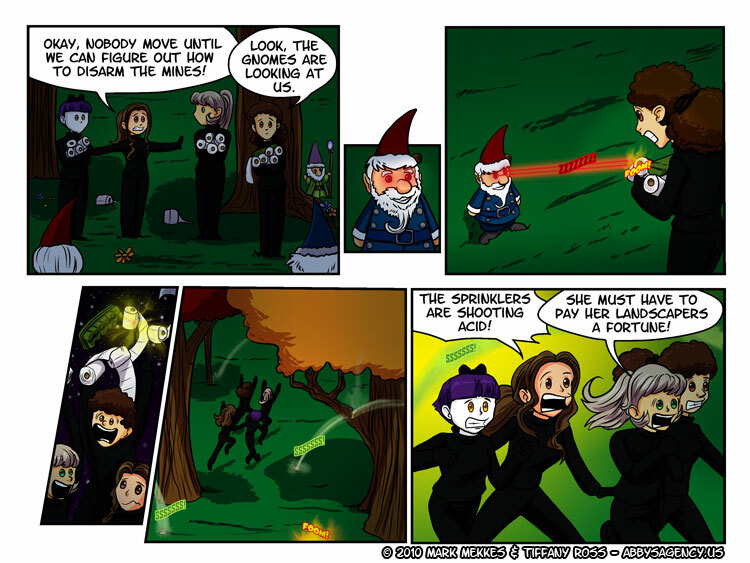 I didn’t expect her to have “weapon” detecting gnomes, acid sprinklers and “land mines”! Although, any dog owner can have land mines in their yard. They’re just not always the explosive kind. The movie “Force 10 From Navarone,” their explosives expert had all sorts of tricks including fake dog poop that was a pressure sensitive explosive device. The bill for repairing the damage and refilling the sprinklers will likely be steep, too. I also wonder how she covers up the damage, or keeps the neighbors from noticing. Didn’t you know? Bond is a member of the Home Owners’ Association, so is Q.